Louis Vuitton has lost its Trade Mark protection for the famous chequered pattern, the Damier. In addition to its “LV” monogram, the French fashion giant Louis Vuitton has been using the brown and beige check – known as the Damier Ebene – since 1888. It successfully registered a European-wide Community Trade Mark (“CTM”) in 1998, and for the cream and grey Damier Azur ten years later. However, Nanu Nana, an online gift item supplier, filed a legal claim to remove protection for these patterns in 2009.
consisted exclusively of a shape giving substantial value to the goods themselves. If a Trade Mark is found to be any of the above, it will be refused protection under the Community Trade Mark Regulations (Article 7). In eight of the 27 European Union countries, Louis Vuitton could not prove it had acquired distinctive use of the Damiers. 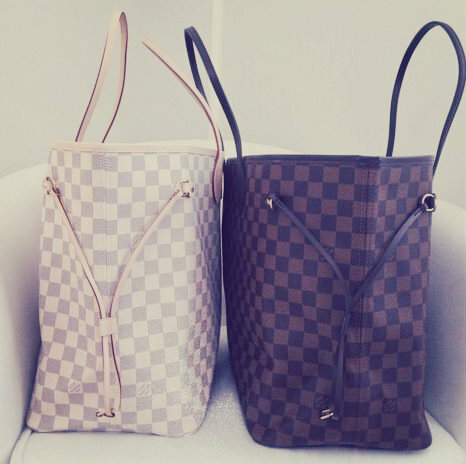 In other words, it could not prove that the Damier was distinctive enough for people to automatically associate it with its origin, being the Louis Vuitton official brand. The Courts therefore cancelled the Trade Mark protection of both the Ebene and Azur Damiers. The marks lack inherent distinctive character. They are too basic, too common and have a long-standing link with leather goods for which they were registered. The evidence provided by Louis Vuitton did not prove distinctive character throughout the European Union (in all 27 countries). Photos of celebrities holding Louis Vuitton merchandise did not prove the brand had acquired a special or well-known distinctiveness through use. Just because celebrities – like supermodel Miranda Kerr – use a particular product, doesn’t mean that the design can be protected under law! Without a protected Damier, Louis Vuitton will now have a harder time going after counterfeit products. What could the brand have done differently? Louis Vuitton’s crux has been lack evidence. Had the brand provided sufficient proof, showing acquired distinctiveness of the Damiers in every EU country, perhaps the Damiers would still be protected. Louis Vuitton now has the opportunity to appeal to the Court of Justice for the EU, which is a route the luxury designer brand will likely take to protect the patterns. Let’s watch this space! What does this case teach us? A mark must be distinctive throughout each and every one of the EU countries in order to be granted an EU-wide protection. Even marks that have been used for over a century can be vulnerable to invalidity claims. The key to protection, as always, is evidence. If sales, PR and marketing data is maintained for all EU territories, distinctiveness and use are easier to prove. Trade Mark erosion is when a trade marked name or pattern becomes generic (think “Hoover” or “Kleenex”). You can help prevent this with savvy marketing, to include identifying and adding a durable distinctive element to the core design. This will help to withstand opposition or cancellation proceedings from competitors. Where a Trade Mark constitutes a valuable asset, businesses should always have a strategic approach to registering multiple marks in their core markets. I’m setting up a fashion business: where do I start?